A large antler rub like this one can be an exciting find during scouting — during Rut Phase II, The Breeding Range Establishment Phase. However, when the opening gun season has started, the dominant buck you want is typically with a doe in estrus — Rut Phase III, The Primary Breeding Phase. During this phase, they are not actively renewing ground scrapes and antler rubs. Most hunters begin a hunting season hoping to take a big buck. Only about one in thirty are lucky enough to accomplish this feat, however, the primary reason being, few hunters concentrate their efforts on trails and sites frequented by big bucks, which are generally quite different from trails and sites frequented by other deer except while does are in estrus. Not realizing this, most hunters simply hunt well-used trails, reasoning the odds for seeing a buck will be better there, or trails along which obvious buck signs, namely antler rubs and ground scrapes, are present (major trails of doe home ranges), typically at a time, unfortunately, when bucks are no longer engaged in making or renewing rubs and scrapes. The fooler is, most trails regularly used by loner adult bucks are little worn, and most hunters therefore ignore them. To more regularly take adult bucks, you must hunt trails and sites (bedding and feeding areas) currently frequented by adult bucks. To identify them, there are certain things you must know and do. Adult bucks are much larger animals (50–100% heavier) than adult does, yearling bucks are about the same size as adult does, yearling does are about twenty pounds lighter than adult does and fawns are about sixty pounds lighter than adult does. Because adult bucks are quite a bit larger than all other deer, they have measurably larger tracks, droppings and beds than other deer, and it is these measurable differences that make it possible to identify trails and sites frequented by adult bucks. 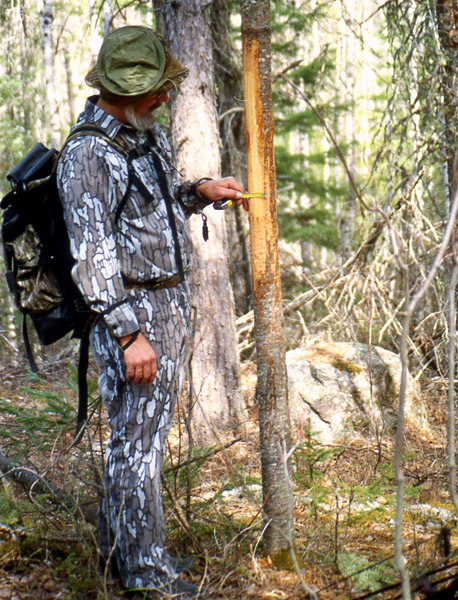 concentrate hunting efforts on trails and sites in which fresh adult-buck-sized tracks, droppings and beds are found. In Minnesota, tracks measuring 5–6 inches in length from tip to dewclaw (the two small indentations behind the hoofs, generally seen in soft soils or snow), or 3-3/8–4 inches in length for hoof only, are those of adult bucks only. Tracks measuring 5 inches in length are those of 2-1/2 year-old bucks and tracks measuring 5-1/2–6 inches are those of 3-1/2–6-1/2 year-old bucks (the bucks we dream of). Droppings measuring 5/8-inch in length, not including the nubbins at the ends, are those of 2-1/2 year-old bucks and droppings measuring 3/4–1-1/4 inch in length are those of 3-1/2–6-1/2 year-old bucks. Beds of adult bucks are 45–56 inches in length. Outside of Minnesota, Wisconsin and Michigan, tracks, droppings and beds of adult bucks are likely to be slightly different in length — longer in Iowa — and shorter elsewhere. To determine the minimal lengths of adult buck tracks in your hunting area, look for several tracks of adult deer accompanied by the smallest of deer tracks—tracks of adult does accompanied by fawns. Some of the tracks you find may be smaller than the others because the does that made them are yearlings. Once you've made such measurements, you can properly conclude any track longer than the largest track of an adult doe with a fawn is the track of an adult buck and any track an inch or more longer, tip to dewclaw, is that of a 3-1/2–6-1/2 year-old buck. Upon finding droppings (big and small) among doe and fawn tracks, you can properly come to a similar conclusion — anything 1/8th-inch longer being the dropping of an adult buck and anything 1/4-inch or more longer being the dropping of a 3-1/2–6-1/2 year-old buck. Upon measuring a bed near which is found another bed that is obviously that of a fawn, you can properly conclude any bed 4 or more inches longer than the larger bed is that of an adult buck and any bed 7 or more inches longer is that of a 3-1/2–6-1/2 year-old buck. Though you are unlikely to see an adult buck until moments before you raise your bow or firearm, after you have established the lengths of tracks, droppings and beds of adult bucks in your hunting area, routine measuring will thereafter enable you to key on adult bucks throughout a hunting season. As a result, you'll not only see more adult bucks, but each time you see one, it will be the kind of buck you imagined it would be upon measuring its tracks, droppings and/or bed on one of its favorite trails, in one of its favorite feeding areas or in its bedding area.